I found this list on the front desk of my office this morning. So I had to track it down. Apparently James Harrison is now replacing both Chuck Norris and Charles Nelson Riley as the dangerous person on the block. Enjoy… Add a few if you like. If you have five dollars and James Harrison has five dollars, James Harrison has more money than you. There is no ‘ctrl’ button on James Harrison’s computer. James Harrison is always in control. Apple pays James Harrison 99 cents every time he listens to a song. James Harrison can sneeze with his eyes open. James Harrison can eat just one Lay’s potato chip. James Harrison is suing Myspace for taking the name of what he calls everything around you. James Harrison destroyed the periodic table, because he only recognizes the element of surprise. James Harrison can kill two stones with one bird. When the Boogeyman goes to sleep every night, he checks his closet for James Harrison. James Harrison doesn’t read books. He stares them down until he gets the information he wants. There is no theory of evolution. Just a list of creatures James Harrison has allowed to live. 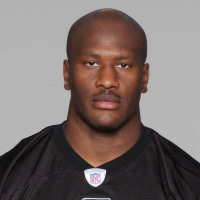 Outer space exists because it’s afraid to be on the same planet with James Harrison. James Harrison does not sleep. He waits. James Harrison is currently suing NBC, claiming Law and Order are trademarked names for his left and right legs. James Harrison is the reason why Waldo is hiding. James Harrison counted to infinity – twice. When James Harrison does a pushup, he isn’t lifting himself up, he’s pushing the Earth down. James Harrison is so fast, he can run around the world and punch himself in the back of the head. James Harrison’s hand is the only hand that can beat a Royal Flush. James Harrison can lead a horse to water AND make it drink. James Harrison doesn’t wear a watch, HE decides what time it is. James Harrison can slam a revolving door. Remember the Soviet Union? They decided to quit after watching hearing James Harrison was born. The only thing fear itself has to fear is James Harrison.